This Sunday, 15 March 2015, marks the 4-year anniversary of the crisis in Syria. For over 1,460 days, the Assad regime—and to a lesser extent, elements of the opposition—have inflicted a ruthless succession of war crimes and crimes against humanity against civilian populations in Syria. Such atrocities, which according to UN Secretary-General Ban Ki-moon should “shock the international conscience”, include the intentional starving of entire communities for the purpose of gaining a military advantage; the terrorizing of populations through the illegal use of barrel bombs and chemical, artillery, and cluster munition assaults; and inflicting gruesome torture techniques upon thousands of prisoners. Click on the button below to read the rest of the statement. 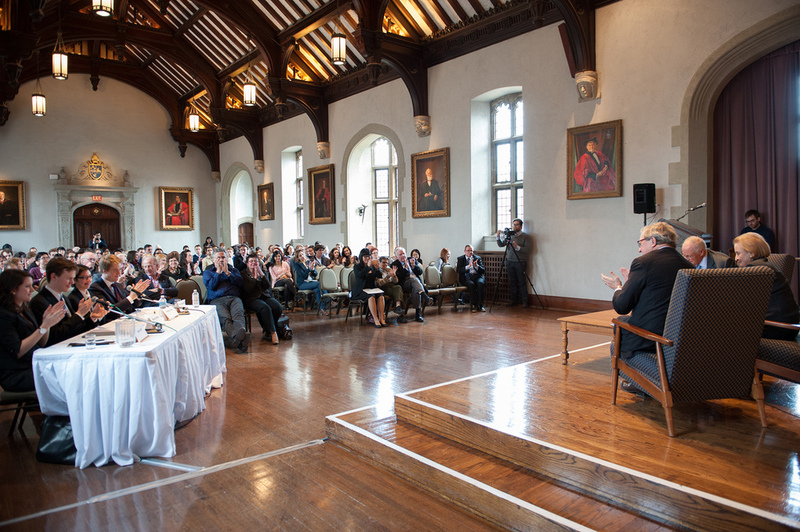 The Canadian Centre for Responsibility to Protect hosted a roundtable on Canadian foreign policy & R2P on Friday, Oct 17th at 12-2pm in room 208N of Munk School of Global Affairs (1 Devonshire Place, Toronto). This event featured an excellent line up of speakers, Master Hugh Segal of Massey College, Very Rev. Lois Wilson, and Member of Parliament Dr. Kirsty Duncan, who commented on Canada’s role on the Central African Republic, North Korea, Iraq, and mobilizing our political will to intervene in light of on-going crises around the world. Please stay tuned for the official transcript! 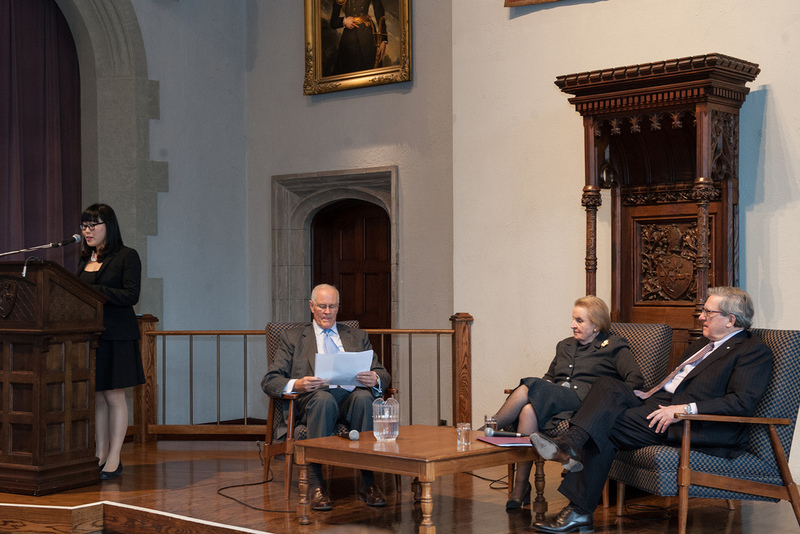 On April 1st 2014, the CCR2P hosted a student panel discussion with Dr. Madeleine Albright and Hon. Lloyd Axworthy, chaired by Chancellor Bill Graham of Trinity College. This event was part of our Rwanda20 campaign to commemorate the 20th anniversary of the Rwandan Genocide, in partnership with the Bill Graham Centre for Contemporary International History at the University of Toronto. On Friday, November 29, 2013, Ms. Tina Park, Executive Director of the Canadian Centre for the Responsibility to Protect was invited to speak at a conference organized by the Public Diplomacy Council of Catalonia in collaboration with the Barcelona City Council. Entitled “Effective implementation of the Responsibility to Protect: The Role of the European Union and the Civil Society,” this conference brought together experts from the civil society, the European parliament, and the general public. Mr. William Pace, Executive Director of the World Federalist Movement- Institute for Global Policy, delivered a keynote address on the origins and principles of R2P, followed by a panel discussion on “Strengthening the R2P within the European Union” and another panel discussion on “Engaging civil society in R2P.” The first panel featured Ms. Maria Badia (Member of the Group of the Progressive Alliance of Socialists and Democrats of the European Parliament) and Ms. Joelle Jenny (Director for Security Policy and Conflict Prevention at the European External Action Service). The second panel featured Ms. Tina Park (CCR2P), Mr. Esteban Beltran (Director of Amnesty International in Spain), Ms. Alena Beutler (Deputy Director of Genocide Alert in Germany), and Mr. Josep Xercavins (Member of the World Democratic Governance Project Association). The panellists shared their own experience in promoting R2P through civil society networks in their respective region. About a hundred attendees gathered at this conference and many of them participated in the open discussion with the panelists. The Canadian Centre for the Responsibility to Protect was invited to advise the First Standing Committee of the 128th Inter-Parliamentary Union Assembly on a resolution on the role of parliamentarians in implementing R2P in March 2013 in Quito, Ecuador. 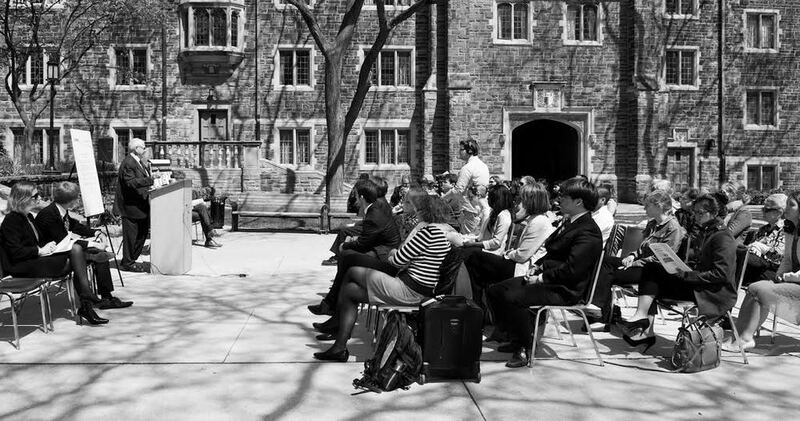 Ms. Tina Park, Executive Director of CCR2P, also delivered comments on the International Humanitarian Law Panel on R2P. Ms. Park’s official remarks at the assembly can be found below. The 128th IPU Assembly in Quito brought together nearly 630 Members of Parliaments from 121 countries. At this assembly, delegates unanimously adopted a resolution titled “Enforcing the Responsibility to Protect: The Role of Parliament In Safeguarding Civilians’ Lives.” The full text of the IPU press release on this resolution can be found at the button below. The original press release can be found here. 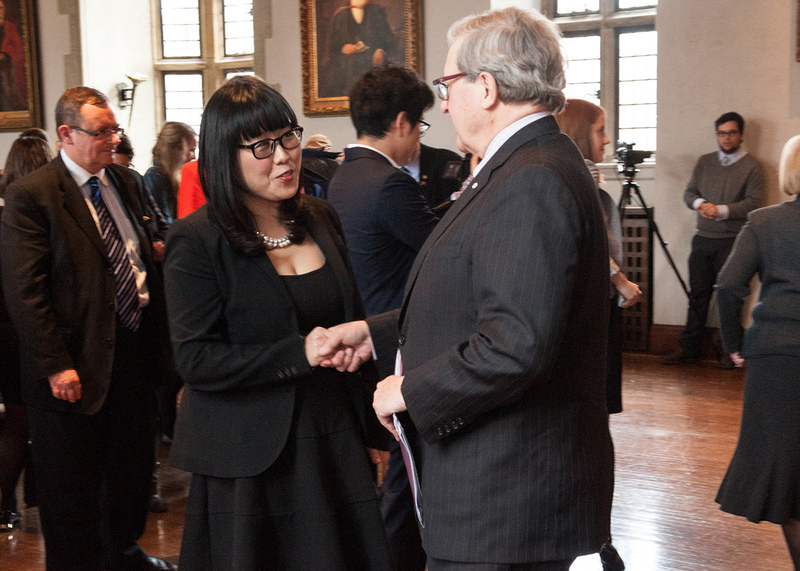 On February 25th, CCR2P Executive Director Tina Park and Advisory Board member Maria Banda, delivered a seminar presentation at the Commons Institute conference at the Old Mill, Toronto. A copy of Ms. Park’s presentation can be found below. On 23 October 2012, Tina Park represented the CCR2P as a speaker at the 127th IPU Assembly in Québec City, Canada. Ms.Park's presentation focused on the role of national parliaments in implementing R2P, notably recommending the establishment of national R2P Focal Points. The IPU is the international organization of Parliaments established in 1889. The Union serves as the focal point for worldwide parliamentary dialogue and works for peace and co-operation among peoples and for the firm establishment of representative democracy. The interactive panel, Enforcing the Responsibility to Protect: The Role of Parliament in Safeguarding Civilians’ Lives, was moderated by Mr. S.H. Chowdury (President of the IPU’s First Standing Committee) and included two parliamentarian co-rapporteurs, Mr. L. Ramatlakane (South Africa) and Mr. S. Janquin (France). Non-parliamentary experts included Dr. Edward Luck (former Special Adviser to the UN Secretary-General on the Responsibility to Protect) and Ms. Tina Park of the CCR2P. Mr. Laurence Marzal represented the IPU. 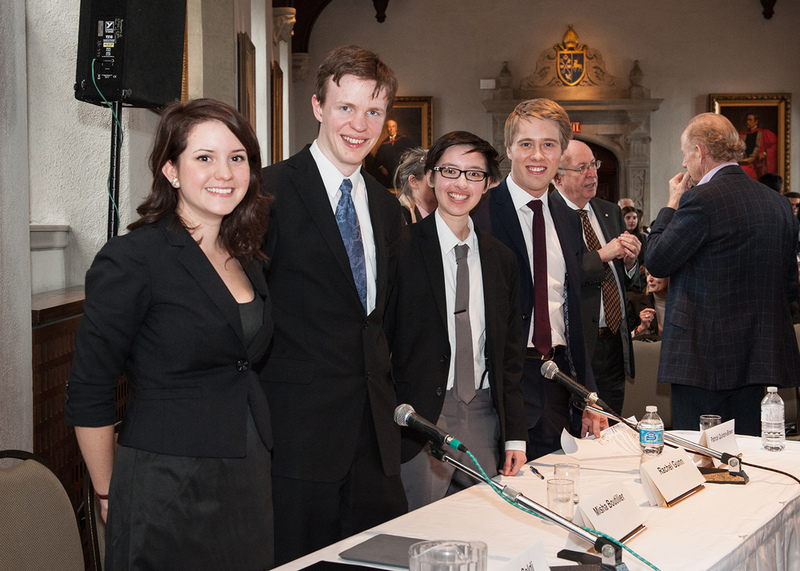 An unofficial transcript of the panel prepared by the CCR2P can be found here. Tina’s presentation transcript can be found here. The CCR2P’s press release on the event can be found here. On 22 November 2012, Victor MacDiarmid and Patrick Quinton-Brown represented the CCR2P at the two-day event hosted by the Igarape Institute and CEBRI in Brasília. Fellow panelists included Oliver Stuenkel (Fundação Getúlio Vargas), Malte Brosig (University of the Witwatersrand) and Leonardo Paz Neves (CEBRI). A post-conference publication, including an article on R2P dissenter states by the CCR2P, will be available for download shortly.